Graces lose off the penultimate ball! A late drop out resulted in new opposition for us in the shape of the memorably named Full Tossers who were our first guests at Winchmore Hill. They turned up in very natty club colour blazers in the sunshine that saw the start of the game. Sam had kindly offered to play for them as they were short a man – this generosity was a theme of the game as it was played in a very sporting atmosphere throughout.The visitors also brought their own umpire who was highly competent. Mahender won the toss (again!) and had no hesitation in batting, Mamun and Niroshan opening. The visitors attack was quite accurate and Mamun was bowled in the 6th over with the total at 14. This brought Mendis in at what is probably his most productive ground. The bowling kept the score in check and when Niroshan was bowled in the 15th over we had reached 47. Dom then had a fine partnership with Mendis – they accelerated the score to 127 in the 30th over with Dom continued his good form with a well crafted 32 before falling to a catch. Sam was bowling at this stage and Mendis was dropped on the boundary off one of his deliveries! Mahender followed at 5 and hit a quickfire 27. Mendis in the meantime had accelerated away to hit a fine half century and reached 65 before being bowled by the finely named Mr Ripper. 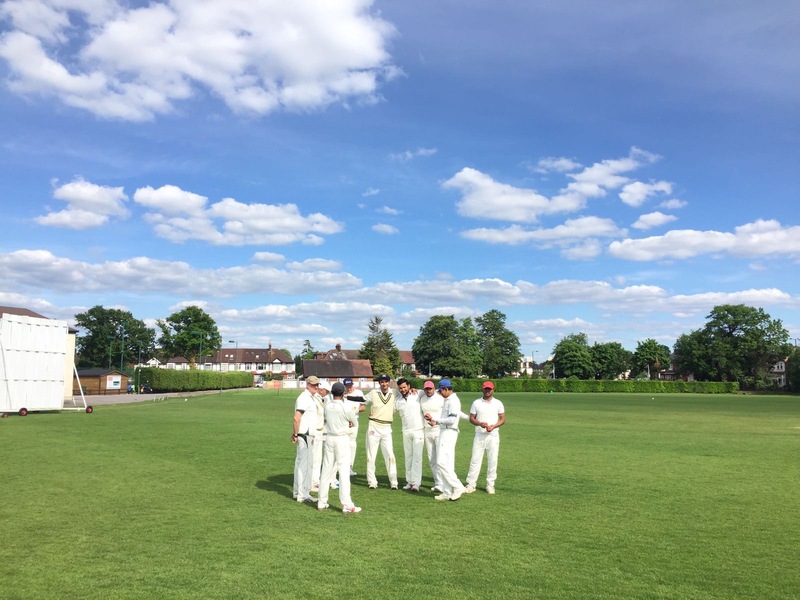 This brought the total to 142 for 4 in the 32nd over – after this no one else really got going and we were all out for 189 off 39.1 overs – missing out on the last 5 deliveries was to prove crucial. Our guests bowled well making us work for the runs and a few catches were put down. A fine tea followed as the clouds gathered. An indication of the sporting air to the match was the opposition’s skipper taking a great boundary catch and then saying that he’d carried it over the line so indicated it was a 6. Mendis and Asad opened our bowling attack and continued the accuracy from the first innings making the visiting openers work for their runs – the first wicket fell in the 8th over with the score at 32. This brought the generously bearded number 3 in who rode his luck initially but then got into his stride with some lusty blows. We continued to take wickets regularly with some great outfield catches from Mahender, Mamun and Stuart amongst others. A rain break was taken and intermittent slight drizzle was a feature of the afternoon. Sadly for us the Tossers can bat all the way down and each successive new face took the attack up – the tall blond number 8 J Lennon (John?) being particularly effective with a range of drives keeping the run rate up. We bowled well keeping the pressure on but there always seemed to be a 4 in every over – a couple of tricky catches were put down that would probably have won it for us. But credit to the visitors who didn’t crack under the pressure with the penultimate ball of the match bringing up the winning runs. So a loss by 3 wickets but a thoroughly enjoyable match and we’re eager to play them next season as well as getting their taylor’s details!